FOODCOURT, made in accordance with traditional Viking cuisine. 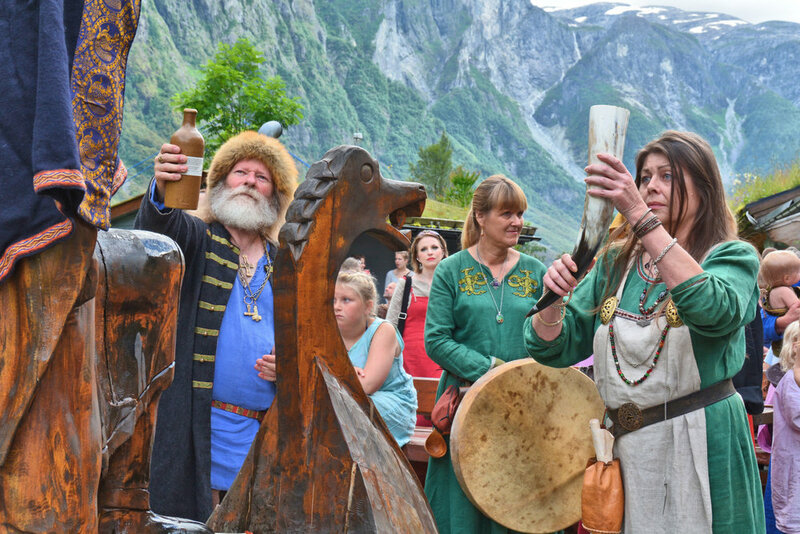 In the foodcourt there will be constant activity and access to food and drinks, made in accordance with traditional Viking methods. Some of the courses will vary by day, for example pit cooking, spit roasting, smoking of food, or the food will dried, salted and cured or fermented. Standard on the menu is a Viking soup with bread, sausage, cabbage salad. Freshly baked pan bread with salmon or cured sausage with wild-garlic sour cream. In addition to fish and meat from the grill with era appropriate side dishes. We put great effort to make sure that our cooking methods are representative of the time era and that our ingredients are fresh and local, but still delicious. The food in the Viking Age is surprisingly “advanced” as they used a variety of methods and a multitude of different herbs that were used for both flavour and medicine, many of which were brought back from their trips around Europe, such as cinnamon, thyme and basil. Garlic was also common in Gudvangen, should you find yourself walking in the fjord during the summer, you might catch the sudden scent of pizza. Many of the herbs previously mentioned where planted and cultivated, now they grow freely around the valley as a living testimony to the Viking Age. Many of the herbs found in the UNESCO-site cannot be found growing in the wild anywhere else in Norway. It is also speculated that many of the imported plants came from dumping old hay from the ships. The name of the fjord and town has a deep-rooted meaning as well. The valley of Nærøy is named after Njord, the god of sea and trade, with the village of Gudvangen meaning “god’s place by the sea”. Vikings did not use the terms appetizer, main course and dessert, rather it was a meal with everything in a pot, or everything on the table at once. Porridge was often the base of most meals, with verities like bacon and cheese or curdled milk added to it. 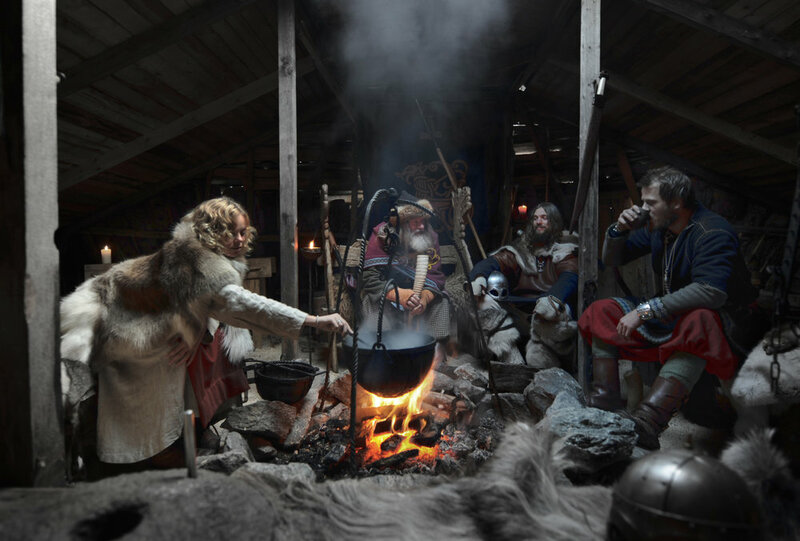 Naturally there would be a difference between the rich and poor, taking our guests into consideration we will be serving food known to be eaten by the wealthier members of society, but then it’s also well-mannered in Viking societies to serve guest the best we have.. When well established members of society would have guests or events, it was customary to serve as many dishes as possible in consecutive order, a bit like a tapas evening. In Njardarheimr we would like to convey the food culture of the Vikings in the form of different tastes and methods of cooking. We put great effort into serving good and era-appropriate meals, yet we also strive to create pleasant culinary experiences that will leave a lasting impression on our guests. The VIP menu can be pre-ordered and consists of five to eight course meals served in the Chief’s Longhall. Each dish will be comprised of new methods and ingredients. Before each meal is served the chef will explain and demonstrate the process used to create it, to provide a deeper understanding of the meal being served. A historical VIP dinner is an entertaining and culinary experience, one that we hope to share with many in the future. Everything from pit-cooking to spit-roasting can be arranged for your group or your special event. Please contact our sales department for offers and we will put together the best menu to suit your needs and budget.